Developer Urban Farmers plans to build a new workforce housing development in Hallandale Beach. The Hallandale Beach City Commission on Wednesday approved the 200-unit project called Eighth Avenue Commons, at 200 Northwest 8th Avenue. 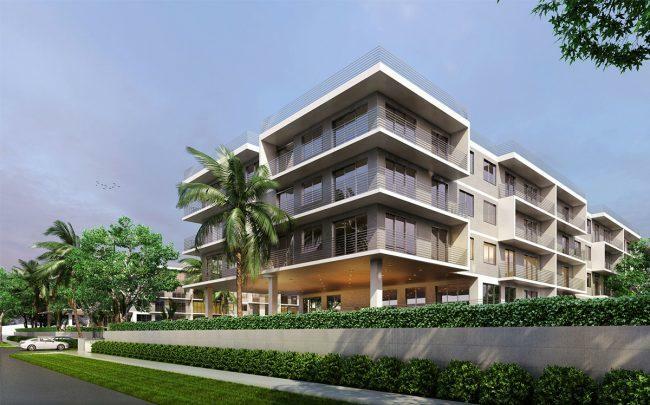 The $42 million multifamily project was designed by Miami-based Kobi Karp Architecture and Architectural Farm, based in Hallandale Beach. The six-story development, which has been in the works for several years, will have 170 workforce housing units, and 30 affordable housing units, including 10 senior housing units, and will take about 24 months to build. Urban Farmers, led by Terry Booty, has not asked the city for a subsidy, but it will receive a $2.45 million Broward County workforce housing grant. The five-acre site, an empty lot that is mostly used for parking, was previously owned by the Hallandale Church of God. Urban Farmers entered into a joint venture with the church, according to Chikia Wright, project manager for Eighth Avenue Commons. The developer paid $100 for the site in 2016, records show. Although the project received a mostly positive reception at the commission meeting, it was not without its detractors. One of the objections to Eighth Avenue Commons was its density: the project will locate 200 apartment units in what had been — until the city commission changed the zoning Wednesday night — a single-family neighborhood. Plus, in order to allow the number of apartments, the city is making available 92 flex units that would otherwise be reserved for the east side of the city, where density is considerably greater than on the west side. Without the flex units, the developer would only be able to build 108 units. Commissioner Anabelle Lima-Taub expressed concerns about the project’s density at a time when the city doesn’t have “a fully-functioning fire department.” Because of a $9.5 million deficit in the city’s budget, there are no plans in the near future to hire more firemen, even though they are needed. Lima-Taub also expressed concerns about gentrification in the area. Recently, she said, a house on the west side, which is a depressed area, sold for $800,000, a sign that gentrification has already begun. Even Keven Klopp, director of development services for the city, acknowledged the development’s flaws. “This is a project that is challenging to support,” he said, because, among other things, the building will not have a garage (there will be surface parking on the first floor, instead) and it will have less open space and landscaping than is optimal. A rooftop garden will make up for part of the deficit in open space and green area, Wright said. While features like a garage and more landscaping would be desirable, said Klopp, they would make the project more expensive, leading to higher rents and gentrification at a time when the county needs more affordable housing.